If you have adware or browser hijackers on your system, it is possible that you went to Bestones.net after clicking an ad generated by one of these applications. 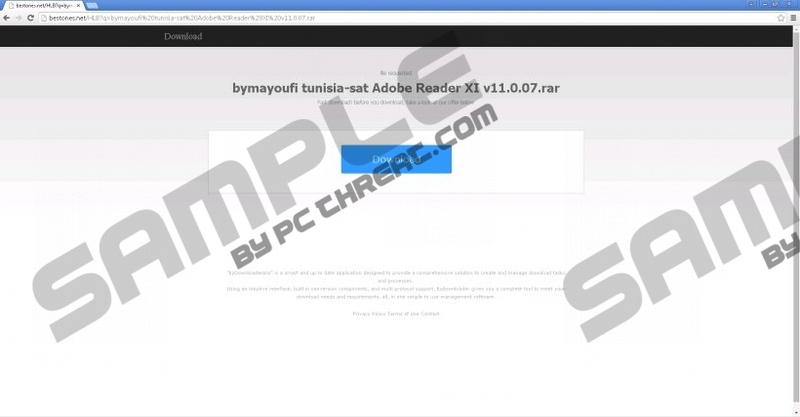 This website hosts various fake software update download links which, in reality, install additional adware or hijackers you will have to delete later. These ad-supported software installers could also hide under the guise of key generator or crack downloads. Seeing Bestones.net is a signal to start hunting for threats on your computer, so you should not hesitate. Delete any suspicious programs you find. When adware or hijackers that use Bestones.net are on your computer, these programs start collecting your browsing data and adjust the types of ads they show you, according to your supposed hobbies. This is all done to make you more likely to click on an advertisement. When you do, you could get redirected to Bestones.net. Whatever you do, do not click any of the download links, as they will only install more adware or browser hijackers. While a single ad-supported program could annoy a computer user with its constant stream of commercial advertisements, it gets much worse with several of them. It is not easy to remove them all at that point, too, unless you have a professional antispyware tool to find and delete them for you. If your computer is in danger of being overrun, such programs can really help you to get your system back on track. If you only have one or two adware applications or hijackers, professional software, like SpyHunter, will serve to control the situation immediately, never letting it get out of hand. Bestones.net is seen when your computer is infected with adware or browser hijackers, after clicking an advertisement or a fake software update link. With that said, it is important to know how these types of annoying programs invaded your computer in the first place. We are here to inform you that adware and hijackers are mostly distributed via freeware bundles. These free software compilations work by having a useful program and several annoying ones. When you start the setup wizard and rush to the end, you agree to install any optional software by default. This is not good, because some of them could be dangerous. You should always choose Advanced setup, and make sure you decline to install optional software. If you already installed a bundle without paying attention, look through your programs and remove any software you do not plan to use. It is not hard to remove adware and hijackers. The difficult part is recognizing what you should delete and what should be left alone. This is where a top-of-the-line spyware scanner comes into play. If you have a program like this, you can easily remove any traces of annoying applications. If, however, you prefer doing it by hand, the instructions are provide below. Go to the Start menu, click Control Panel, and select Add or Remove Programs. Find any undesirable programs, select them, and click Remove. Go to Uninstall a program and select any programs you find suspicious. Right-click the lower-left corner of your Desktop. Select an undesirable program and click Uninstall. Quick & tested solution for Bestones.net removal.